P-3809 AN IMPORTANT XOCHIPALA FIGURE OF A BABY MIDDLE PRECLASSIC PERIOD, ca 1150 B.C. to 550 B.C. Xochipala, Guerrero Region, Southwest Mexico. Provenance: 1) The Jay C. Leff Collection, Uniontown, PA, 1967. 2) The Otto Atencio Collection. 3) The Merrin Gallery, New York. 4) A New York Private Collection. Conservation & Examinations: 1) Michael Kan, Curator Emeritus, Detroit Institute of the Arts, served as Curator for the Jay C. Leff Collection, vetted this figure for the collection in 1967. This superbly executed figure of a standing baby with a piercing gaze, and the right hand held to the mouth, the left hand held to the left ear, is adorned with a closely fitted cap which has incised decoration in two areas, in the form of a five-pointed floral design on the right side, and concentric arching semi-circles engraved high on the left side. The facial features are stunningly realistic. The Preclassic Xochipala culture is contemporaneous with the Olmec culture, the first major civilization in Pre-Columbian Mexico. 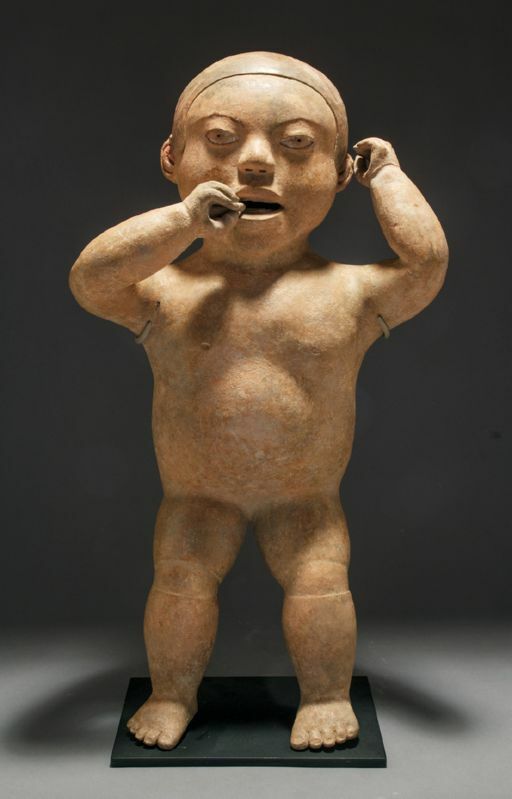 The baby seemed to be one of the focuses of the mainstream in Xochipala culture, as there are other lesser depictions extant. This baby is probably from a regal or chiefly family, as he seems to be quite venerably decorated.